"Thanks for being candid in your inquiry regarding accusations of sexual assault. God knows I also have been falsely accused of things of this nature in the past as well, so I sympathize. Sometimes a woman thinks she get an upper hand on a man by making such accusations. And I agree that it is a good thing for women to expose sexual predators if they are indeed victims of such a thing, mainly because it will help to put an end to such horrible behavior. It troubles me as well that social media moralists are also talking about believing every accusation without question or inquiry or examination or trial, especially if the accused denies the accusation. In America, at least, this should be denounced, as our justice system is made to presume innocence until guilt is proven. Throughout history, accusations of sexual assault have been used to humiliate innocent people, and there are literally dozens of examples that run through my head, so that perhaps a book could be written on this subject alone. This was a particularly favorite type of accusation employed by the Ottomans to humiliate Christian clerics and get the people to turn against them. It was also employed by the Nazi's and Communists as well. And it is quite effective of an accusation, because our instincts are to pity the woman no matter what, especially in times past when a woman's innocence and purity were more greatly valued. Because these things were more greatly valued in society, it was also easier to believe a woman who made such an accusation. But those who did make a false accusation did so primarily either because they were greatly compensated to do so by enemies of the accused, or because they were threatened to do so, or because they had something worse to hide. Since you asked for specific examples of honorable people, and there are many I could name, I will save us the time and focus on one specific example from the lives of the saints that I think is more than sufficient, who when I hear about someone who was falsely accused of sexual assault, my mind immediately turns to. Interestingly it is a woman, and she is known as Saint Theodora of Alexandria, who is celebrated by the Church on September 11. It is believed Theodora lived around the fourth century in Alexandria, Egypt. She was a happily married woman and a pious Christian. One day, a certain rich man was captivated by her beauty, and for a long time tried to seduce her to sleep with him. He was unsuccessful until a loose woman informed her how she could commit a secret sin against God, saying that God can only see things on earth when the sun is shining, but when the sun goes down sinful acts become unknown to God. In her naivete, Theodora believed this to be true, and she committed adultery when the sun was down, believing her sin was a secret from God. It didn't take long however for her conscience to accuse her of her sin, and she realized that the conscience is the ultimate accuser and serves as a voice of God. It devastated her that she sinned against God and her husband, so she decided to leave her husband and go and live in a monastery to repent of her sin. The problem was that there was no female monastery around at the time that she knew of, so she decided to dress as a man and enter a male monastery as a man named Theodore. To make a long story short, Theodora hid her female gender for three years in the monastery, yet she surpassed all the men in the monastery in her asceticism, labors, obedience, vigils and in the acquisition of the virtues. And not once was she ever suspected of being a woman. One day, Theodora was sent to Alexandria to buy provisions. After blessing her for the journey, the abbot indicated that in case of a delay, she should stay over at another monastery, which was on the way. In that village was a girl, who became attracted by the handsomeness of the young "monk", so she tried to seduce the monk Theodore into the sin of fornication, not knowing that it was a woman standing before her. Meeting with refusal, she committed the sin with another guest of the monastery and became pregnant. Meanwhile, Theodora bought the food and returned to her own monastery. After a certain while the father of the shameless girl, realizing that his daughter was pregnant, began to question his daughter about the father of the child. The girl indicated that it was the monk Theodore who forced himself on her, though "he" had in fact rejected her. 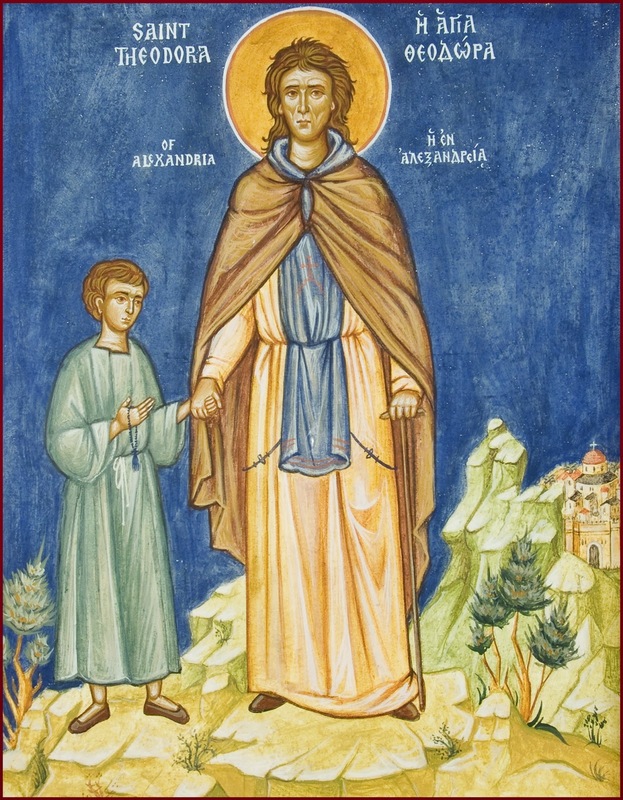 Upon the birth of the child the father at once reported it to the abbot of the monastery where Saint Theodora labored in asceticism, bringing the child as evidence. The abbot summoned the Saint and repeated the accusation. Theodora firmly replied: 'As God is my witness, I did not do this.' The abbot, knowing of Theodore’s purity and holiness of life, did not believe the accusation. However, the other monks did believe the accusation. Not wanting to reveal her identity, Theodora remained silent before her accusers, and was expelled from the monastery and forced to take the child with her. For seven years Theodora lived by herself with the accusers child in extreme poverty outside the monastery, in the heat of the summer and the cold of the winter. When her seven year penance was completed, she was allowed to reenter the monastery. 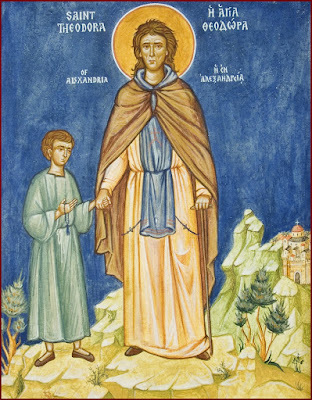 She doubled her asceticism, labors and prayers, and became full of love for God, while also she raised the child, that was not hers, to love Christ and a life of virtue, truly making him her son according to the Holy Spirit. Soon after her return to the monastery, Theodora died. That night the abbot saw in a vision a woman clothed in shining garments joining the chorus of saints in heaven. That was when the abbot and all the monks went to her grave and saw beneath her clothing that monk Theodore was a woman all along. With this revelation, they all wept in sorrow begging for forgiveness from God for believing the slander against the Saint without question, and they praised her for remaining silent before her accusers. So here we have a woman dressed as a man falsely accused of sexually assaulting a girl who became pregnant. Silent before her accusers, Theodora was willingly punished severely, even though she could have proven her slanderer wrong at any time. All believed the accuser over her, perhaps thinking her silence was proof of guilt. This is why to me, Saint Theodora of Alexandria is the patron saint of all those who have been falsely accused, especially of sexual assault. She is a model to follow, as best as possible, in these situations. Hope you find this information helpful."